We are living in times when national identity is often devoured by an increasingly globalized world. Some artists use art to keep their heritage alive, while others absorb and fold into it influences from encounters with other cultures. Contemporary music ensemble Bent Frequency provided a concert on Thursday performing compositions by four living Chinese-American composers at Kopleff Recital Hall, reflecting this potential for ambivalence through pieces that blend the composers’ Chinese roots with their American cultural experiences and post-graduate Western musical training. The concert was timed to roughly coincide with celebrations of Chinese New Year, which began on Tuesday. Such celebratory programs are unfortunately all-too-often stereotypical in their portrayals of Chinese culture to Americans, but that was not at all the case with this concert. Rather, it was a serious look at the adventurous works of the different composers, all of whom hold American doctoral degrees in music. Jin Ping opened the program with his “The Rites of the River Gods,” performed by trombonist Bill Mann and percussionist Stuart Gerber. 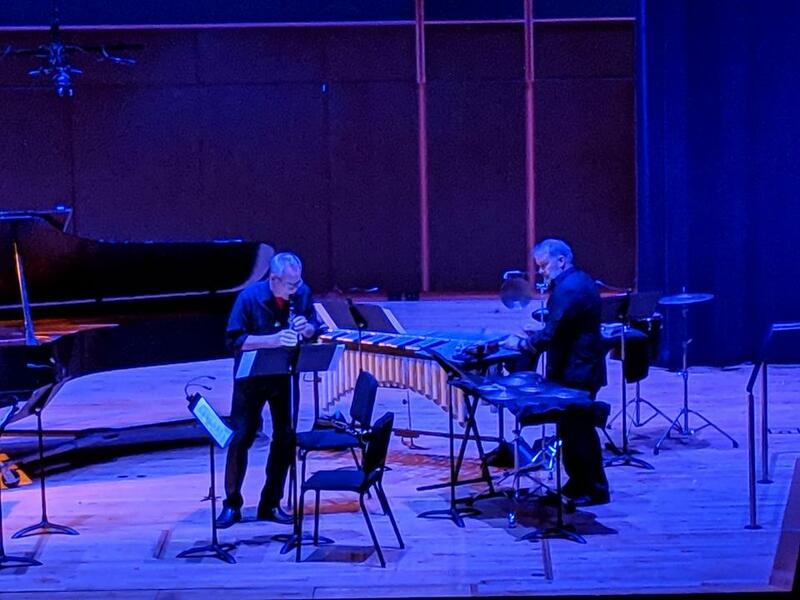 Interestingly, Gerber was also the percussionist for its premiere in 1998 at Cincinnati College-Conservatory of Music, where both he and Jin earned their doctorates. The trombone part largely explored the instrument’s vocal qualities, its lyrical aspects including subtle pitch bending, while also interjecting with contrasting emotional outbursts. In that sense, the trombone served as the protagonist in a human monodrama with the percussion providing the scenic backdrop against which it played out. 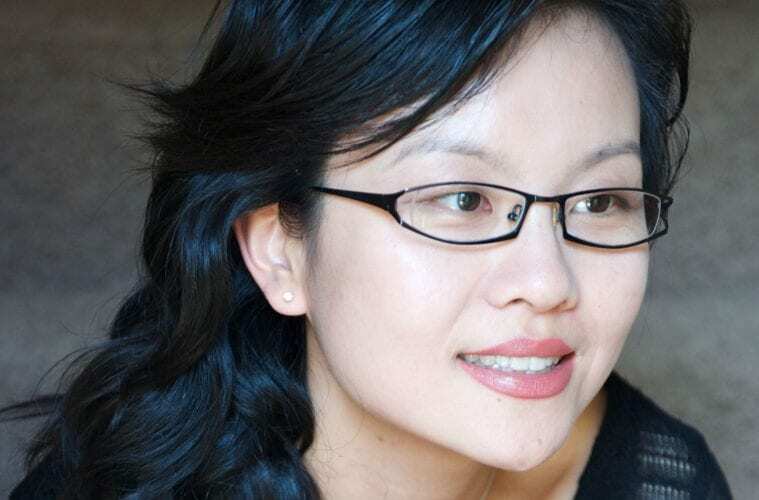 Dorothy Chang is the only one of the four composers born in the United States — the Chicago suburb Winfield, Illinois — earning her music degrees from University of Michigan and Indiana University School of Music. Her “Two Preludes” were performed by saxophonist Jan Berry Baker and pianist Erika Tazawa in two movements, the first slowly unfolding in a manner that was spacious and transparent with a free and spontaneous feeling to it. The second was aggressively virtuosic in its energetic, exuberant speed and shifting rhythmic pulse. Bent Frequency wrapped the concert’s first half with “The Han Figurines” by Chen Yi, the first Chinese woman to receive a master of arts in music composition from the Central Conservatory of Music in Beijing. 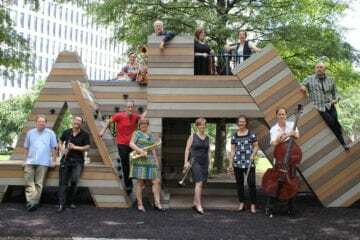 Baker, Tazawa and Gerber were joined by clarinetist Ted Gurch, violinist Adelaide Federici and contrabassist Emily Koh for the sextet inspired by clay figurines of the Eastern Han Dynasty (25–220 A.D.) with their exaggerated forms and postures. Chen’s music vividly evoked the elements of strength, motion and velocity the figurines imply. The second half of the concert was reserved for the guest of honor, composer Xi Wang, who led a seminar at Georgia State University in the afternoon and a preconcert talk about her music prior to the evening concert. Gurch, Federici, Tazawa and Gerber returned to the stage with flutist Matthieu Clavé and cellist Brad Ritchie to perform Xi’s Echo.Poem.Image. At just over a half-hour duration, when Echo.Poem.Image is performed in its full regalia, it is a theatrical work that involves dancers and visual effects in addition to the music. In this instance, a mostly darkened stage with minimal movement by the musicians had to suffice. Nevertheless, the multimovement work made its points well despite the limitations on the theatrical elements — no dancers, no visual projections. Of all of the works in the program, Echo.Poem.Image had the most overt references to Chinese culture. While the first movement, “Silhouette,” is more involved with purely musical concerns of timbral fusion and microvariations of melody and rhythm, “Nostalgia” references a Chinese poem in its depiction of a lonely soul in desolation. “Operatic Rhapsody” evokes elements of the Beijing Opera (Jīngjù), in particular the emulation of a Chinese sheng, an important instrument in Chinese opera, by the E-flat clarinet. 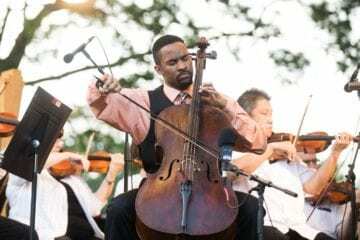 The fourth movement, “Love Song,” is lyrical, with violin and cello depicting the antiphonal singing at a distance of young women and men expressing their mutual admiration. The full ensemble played the final movement, “Carnival,” which playfully juxtaposed materials from all of the preceding movements in a kaleidoscopic musical montage.